Blind pimple is a swelling-like bump which is pinkish/reddish in color. It does not have a head i.e a white/black point in the center. It is also called ‘Papule’. It is formed in the same way as a normal pimple but since the pores are clogged, the head is absent. They are particularly hurting because they are caused by a deep inflammation under the skin and closer to the nerves. 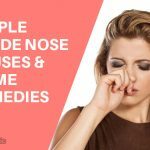 Nose is the commonest spot of their occurrence. They don’t have pus and their sizes may vary. It often causes scarring too. Since the surrounding skin tissues have also been affected, they do not develop a head or pus. They are also caused by the sebaceous glands becoming overactive and producing excess oil and clogging the skin pores. A lack of hygiene and excessive sebum that causes the skin to get clogged are the main reasons. Hormonal changes right before the beginning of menstrual cycles can also cause the blind pimples. Initial Stage when it has just started to form up and is red in color. The pimple can be neutralized at this stage itself. Later Stage is when it begins to grow a head. There are various remedies available to get relief from the pain, inflammation and irritation they cause. Some of them are so easy that you shall be thanking us at the end of this piece of information. 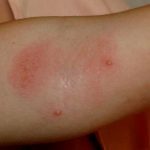 Let’s see few ways we can treat blind pimples. Take a piece of cloth, put in in hot water and let it soak. Then put this warm cloth onto the blind pimple and hold it for a while. This process must be repeated multiple times till the blind pimple develops a head. A black tea bag soaked in warm water can also be used for a warm compress. Tannin, an active component of the tea will help in reducing the inflammation caused by the blind pimple. The warm compress is very helpful because it speeds up the healing process by boosting the blood circulation and making the head emerge out. This head will bring out the infectious liquid and the pimple will start to heal. Application of toothpaste on the affected area is also said to bring a lot of relief to the affected area and to speed up the healing process. But people with a sensitive skin must avoid this treatment because the chemicals in the toothpaste may not go very well with the skin in all cases. It is to be ensured that for this purpose a white toothpaste is used as it contains clove oil or mint which might aid in reducing pimple size and help in getting relief from the redness and the soreness. Take a little white toothpaste and apply it over the affected area and leave it for a few hours. Then wash the face with slightly warm water and practice this everyday till the pimple is no more there. Milk is helpful in removing the oil and dirt that have gathered up and unclog the pores by removing the dead cells from the outermost layer of the skin. It has something called AHA (alpha hydroxy acids) which helps it do the job and smoothen the skin. Take some milk and a ball of cotton. Dip the cotton ball in milk and apply it on the blind pimple and leave it for a few minutes. Wash the area with slightly warm water after that. This should be done once in every 5-6 hours till the pimple gets cured. The tea tree oil is rich in antibacterial properties which make it a great bacteria-killing agent. It is helpful in killing the pimple causing bacteria and helping any more of them. It also helps expedite the healing process. 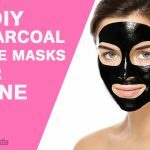 It cleanses the skin and opens the pores which had been clogged. Take around 10 ml of tea-tree oil and mix it well in about 90 ml of water. Use a cotton ball to apply this on the pimple. The skin should then be left for about 10-15 minutes before being washed. Then we can use a light moisturizing cream thereafter. This process must be repeated around twice or thrice daily for best results. Pressing the affected area slightly with ice for several times a day would help lessen the swelling and soreness and would help us hide it for a while. Applying an ice compress several times daily for about 10 minutes every time is the trick. Take some apple-cider vinegar with cotton and lightly apply it over the affected area and leave it to dry before washing it off. Apart from the antiseptic properties it has, it also improves the circulation of blood in that area. Take an apple and put it in a mixer to convert it into a pulp. Add honey to the pulp and turn it into a paste. Application of this paste over the affected area and the leaving it for about 15 minutes before washing it off would be helpful. Applying honey alone with a cotton ball on the blind pimple is also good to make it disappear soon. Squeezed 2-3 lemons and with cotton, apply the cotton juice to the pimple and then wash in some time. The citric acid in the lemons would help dry the pimples out. Applying Aloe Vera juice on the pimple will help prevent/fight any infection in the pimple. This should be kept on for 15-20 minutes daily and then washed up. It should be practiced twice or thrice daily. It helps relieve pain, inflammation and irritation associated with this kind of pimples. 1 teaspoon of Epsom salt mixed in ½ -cup of lukewarm water applied on the pimple with cotton will help. Wash it upon drying and repeat few times a day for the next few days till the pimple subsides. It disinfects the skin and prevents bacterial growth in the region. It will also help clear the clogging in the pores and the pimple would soon be gone. Dip a little rubbing alcohol in cotton and cleanse the area with it. Leave it on for about 30 minutes and then wash the face. Repeat it several times a day till the problem is solved. Instead of rubbing alcohol we can also use perfumes or deodorants that contain alcohol. 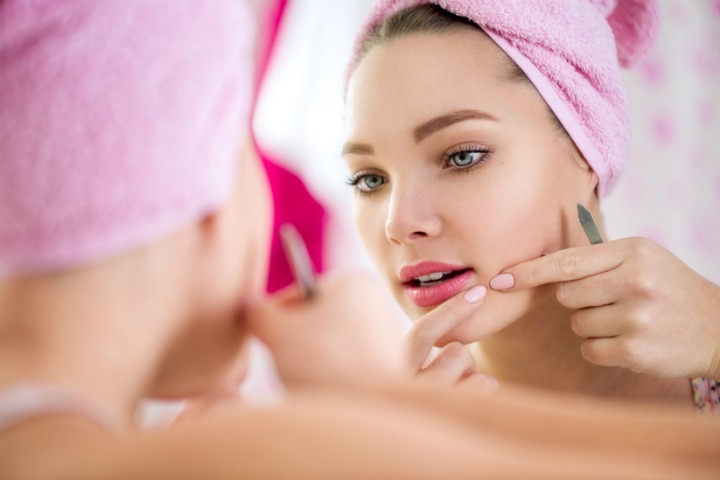 Products containing sulfur, alpha hydroxy acids, benzoyl peroxide or salicylic acid can also be used to relieve the pimples and keep the skin clean. They are generally present in facewashes and the such. Your dermatologist may even prescribe you medicines antibiotics or retinoids, but that’s up to them. Maintain good skin hygiene as lack of hygiene is a precursor to any kind of pimples. Maintenance of proper hydration helps keep the body clear of toxins and avoid pimples. A healthy amount of sleep and exercise also play a vital role in prevention. Avoiding to much stress also helps us stay away from pimples. A healthy diet is very important in avoiding any problem. We have discussed all aspects about blind pimples viz their causes, cures and prevention. We hope it helps you keep a clearer skin. How to Get Rid of Facial Hair Naturally at Home? 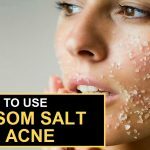 How to Treat Acne With Epsom Salt? 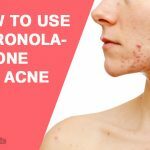 How Effective is Spironolactone for Acne? Blind pimple is a swelling-like bump which is pinkish/reddish in color. Let’s see few ways we can treat blind pimples.